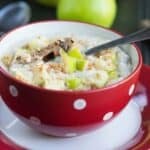 Creamy apple coconut oatmeal – no more plain old boring porridge, this recipe sees oatmeal combined applesauce such a tasty match made in food heaven. Am I the only person who gets bored of eating the same thing over and over again? I believe there is an element of truth in my rhetorical question. 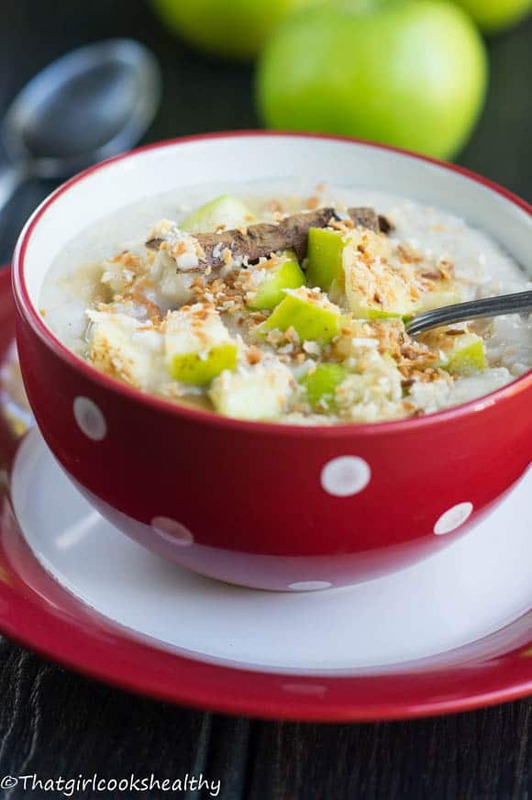 Lately I’ve been switching up my diet, just a notch with this creamy apple coconut oatmeal because I’m the type of woman that gets complacent, eating the same breakfast in the morning with slight adjustments on the weekend. When it comes to preparing breakfast I’m always on the hunt for something that’s quick, easy and filling in no particular order, so long as those three requirements are met, consider me a happy bunny. Smoothies are healthy and taste delicious and an omelette is equally as good BUT……….I’m yearning for something new and I think I’ve found my answer within this post. 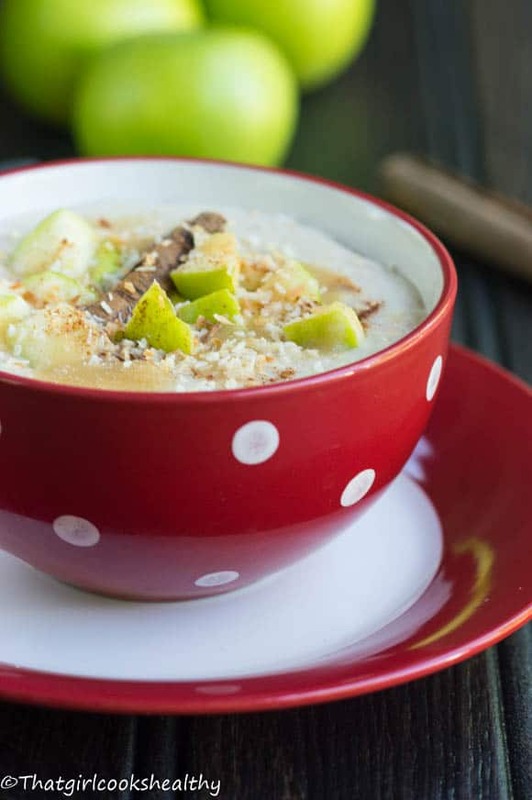 Creamy apple coconut oatmeal will have you buzzing!! 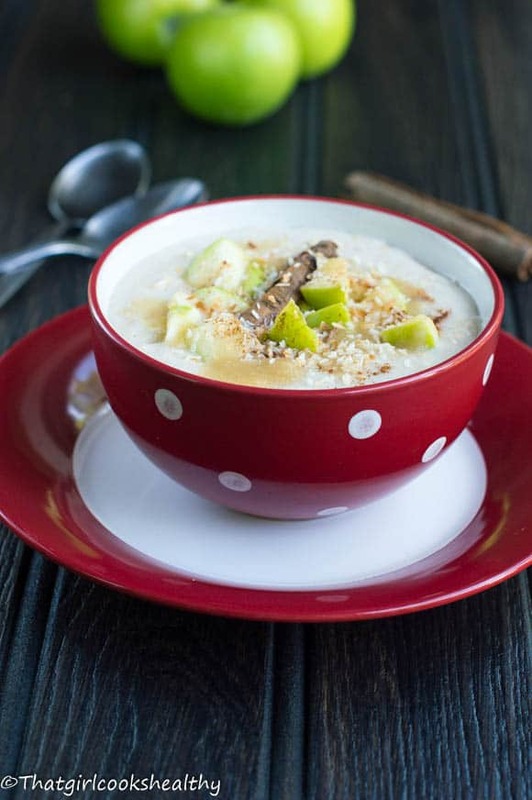 This creamy apple coconut oatmeal had me buzzing for days, it’s an innovative spur-of-the- moment recipe. The type that has made it’s rightful place on my blog. While I haven’t been eating this specific connotation consecutively, it’s definitely played a part in my breakfast regime more times then I care to admit. The question is; How to you like your oatmeal? The answer is debatable for the most part, some like a gluely consistency, while others settle for a creamy texture – you can’t win. 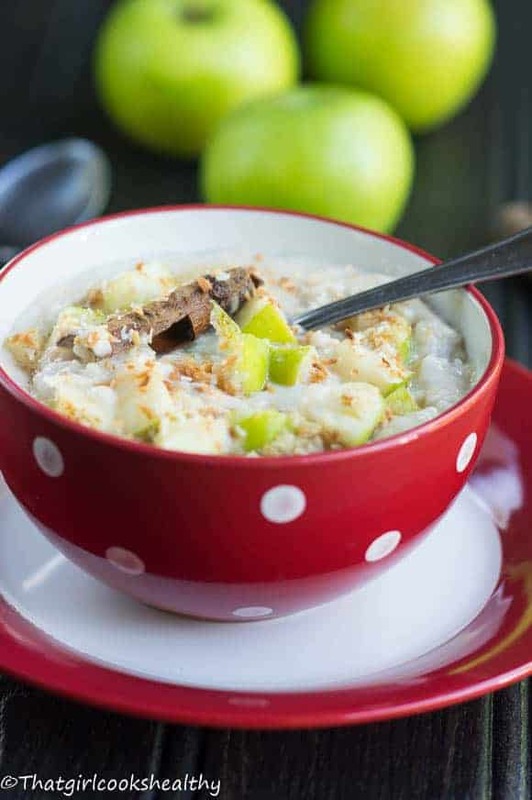 I prefer a creamy consistency myself and that’s exactly what you’ll be getting with this recipe – creamy, creamy and MORE CREAMY apple coconut oatmeeal – Aside from the protein, magnesium, iron, healthy saturated fats, vitamin B6 and C – all in one helping. The ratio of coconut milk to water is slightly higher, which lends a smooth texture and I also included some homemade apple sauce during the formation of the oatmeal to heighten the creaminess whilst adding a tiny bit of sweetness. The topping will explode with your mouth; toasted shredded coconut on a layer of apple sauce with a sprinkle of cinnamon. How do you guys like your oatmeal? What’s your favourite topping? Preheat the oven to 350 degrees (gas mark 3). Place the shredded coconut on a baking tray lined with parchment paper and toast coconut in the oven for 3-4 minutes or until golden brown (shouldn’t take long to darken). Meanwhile, in a medium sized saucepan add the coconut milk and water and bring to the boil over medium heat. Once boiled, begin to stir in the cinnamon, apple sauce, vanilla and oats. The mixture will start to thicken up after a few minutes (around 4 minutes). Garnish the bed of oatmeal with applesauce, toasted coconut, cinnamon and banana. As much as I love coconut, I have never tried using coconut milk in my oatmeal. I bet they really pack a punch with apple sauce and cinnamon spice. Can’t wait to try it. Do give this a try, I promise you will love it too Imma.